Once upon a time , there was a kingdom named Medang Kamulan ruled by king named King of Gods Cengkar wild and likes to eat human . Every day the king takes a man who was taken by Patih Jugul Young . A small portion of the people who fret and fear fled secretly to other areas . In the hamlet of Kawit Medang a young man named Aji Saka powerful , industrious and good-natured . One day , Aji Saka managed to help an old man who was beaten by two robbers . Old man who eventually appointed by Aji Saka 's father turned out to refugees from Medang Kamulan . Hearing stories about the King of Gods Cengkar savagery , Aji Saka Medang Kamulan intend to help people . By wearing a turban on the head of Aji Saka went to Medang Kamulan . The journey to Medang Kamulan not smooth , Aji Saka had fought for seven days and seven nights with the devil forest watchman , because Aji Saka refused enslaved by demonic gatekeepers for ten years before being allowed to pass through the forest . 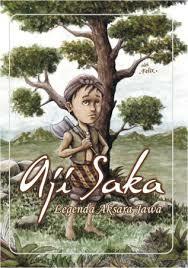 But thanks to the miracle , Aji Saka managed to escape from the vicious flame . Shortly after praying Aji Saka , a beam of light from the sky hit the yellow highlight demons at once eliminate forest dwellers . Aji Saka arrived in Medang Kamulan quiet . In the palace , King of the Gods are angry because Patih Cengkar Young Jugul not bring the victim to the King . With bold , facing King Aji Saka Cengkar Gods and gave himself to be eaten by the King in exchange for the use of the land area of ​​the turban . When they are measuring soil on demand Aji Saka , turban stretches so wide breadth exceeds King of Gods kingdom Cengkar . King was angry after knowing the real intentions of Aji Saka was to end his despotism . When the King of the Gods Cengkar angry , Aji Saka turban wrapped around the body stronger at the King . King of the Gods Cengkar body thrown Aji Saka and crashed into the sea south and was lost in the waves . Aji Saka then crowned king Medang Kamulan . He brought his father to the palace . Thanks to a just and wise government , Aji Saka kingdom Medang Kamulan to deliver the golden era , an era where people live quiet , peaceful , prosperous and prosperous .